Over the last 5 years, we’ve hauled a lot of rock out from various areas of the yard. 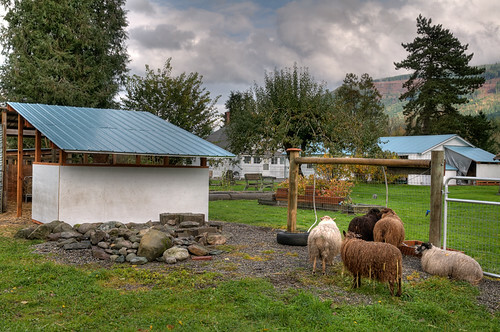 This weekend, we decided to recycle that rock into a jungle gym of sorts for the sheep. Hoof observation and treatment continues, and I’m inquiring about soil and forage testing through Univ of Idaho. Everyone seems to still be getting around without difficulty, and morale is high, so at least it doesn’t seem to be impacting their quality of life- but it does worry me and I really hope to get to the bottom of it. I’m beginning to think that perhaps there’s something problematic in the sheep ration/alfalfa pellets that I have been giving them as treats- because Griff’s feet look the best of anyone’s, and he’s the one I’ve had the least interaction with the whole time they’ve been here! Thing is, I don’t have the bags for either product any more, and I haven’t had any sucess digging up content info for them online. So, for now, I’ve discontinued the treats. Just hay, pasture (which of course isn’t growing much now) and mineral. So at least I’ll know exactly what the inputs are. Thinking of something vaguely Cowichan-ish for The Man. Maybe they have Short Sheep Syndrome? I hope you get to the bottom of the foot thing 🙂 We trimmed our flock’s hooves and some had longish growth, and there was some rare separation we were able to trim away. Since Tom was doing the trimming this year, there was more bleeding than usual, which broke my heart, but at least they are trimmed and their hooves look good for the rainy season. I think perhaps they do. Always gotta be on top of something. Bunch of crazy guys. And something vaguely Cowichan-ish sounds perfect!